It was another slow and dull day at Gunk Haus. Nothing exciting happened. I fixed a few more holes in the Stube floor. E! 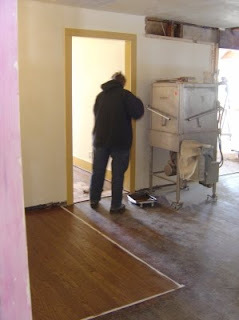 stained the wood floor in the Piano Nook and the hallway to the bathrooms. 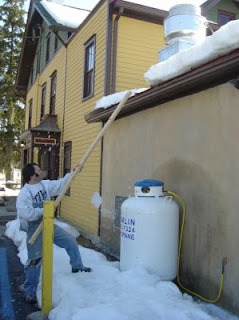 I poked at some snow overhangs on the roof. Nothing exciting, as I said. And by nightfall it was time to kick back. But hey!!! Who's that guy?! And what's he carrying?! Look, there's more of that stuff!!! Enough to fill the bar!!! Well, E! 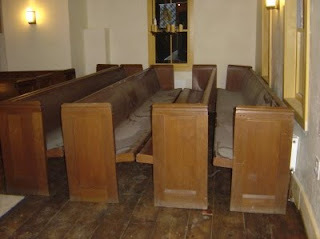 had found some church pews on Craig's List. 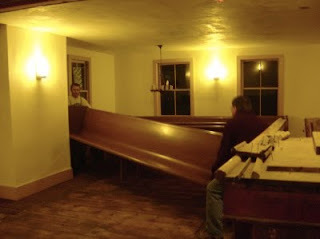 For a while now we had talked about building the booths in the beer hall from church pews. 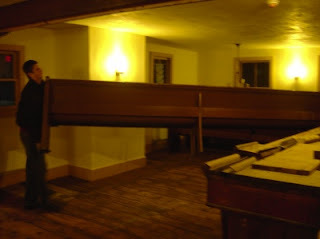 And these we liked a lot, and there were enough to also get some to build the banquette on the western side of the beer hall. 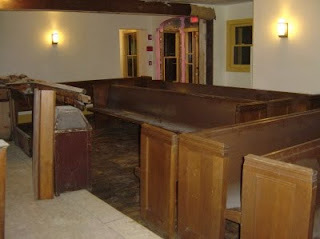 I'm going to start calling Gunk Haus "church", as in "Oh, don't worry about me, dear, I'll be at church." I think the Gunkhaus may be out favorite house of worship!